Virender Sehwag – the name is enough to terrify any bowler in the world, the destroyer who can tear apart any bowling attack in the world, the philosopher who sees the word 'Impossible' as 'I m possible'. The man who is slowly turning himself into a phenomenon. Maybe he is not worshiped like Sachin Tendulkar, maybe he is not technically perfect like Rahul Dravid, maybe he is not a magician like VVS Laxman but still he is one of the most charismatic cricketers of our times, his genius is often ignored in a star-studded batting line-up. 4 days ago when he broke Sachin’s record of the highest individual score in ODIs in Indore, it didn't come as surprise because all of us were well aware of his abilities. In fact, Virender Sehwag was supposed to become the first person to score 200 runs in a single innings in ODIs but 'master blaster' Sachin Tendulkar reached this feat before him and I bet even he (Sachin) knew if anyone could break his record it’s got to be one and only Virender Sehwag. 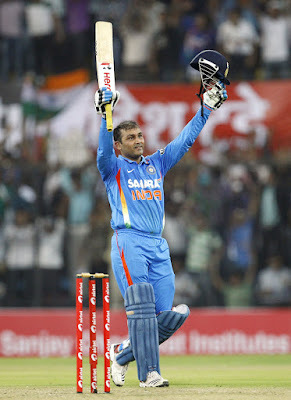 For me Virender Sehwag is not just a player, he is an attitude. He doesn't believe in planning for the future, he believes in living in the present and tries to enjoy each and every moment. This simple but effective formula has helped him reaching where he is today. By his fearless attitude, he lifts the morale of the whole team, his 30-40 minutes stay at the crease is enough to demoralize any opposition. Sometimes his quick 25-30 runs go unnoticed, no one notices the impact of his quick cameos and how it changes the course of a match. Virender Sehwag is the first and only Indian cricketer to score a triple hundred in Tests and he has done it twice - once against Pakistan at Multan and once against South Africa at Chennai. He missed his 3rd triple hundred by only 7 runs against Sri Lanka. He currently holds the record of the highest (319), 2nd highest (309) and 3rd highest (293) individual scores by an Indian in Tests. These are just some examples of his impact over Indian and world cricket, he has a tendency of scoring big runs in Test cricket and unlike other explosive openers he is doing it quite consistently over the years. Yes, there was a time when he was struggling with his form and got dropped from the Indian team but as they say Form is temporary but class is permanent, he made a comeback in the Indian team after some months and since then never looked back. Virender Sehwag has established himself as one of the greatest opening batsmen cricket has ever seen. Mind you, Virender Sehwag is not a natural opener; he had started his career as a middle-order batsman and scored a hundred in his debut Test against South Africa at their home-turf. But the way he has converted himself into a full-time opener shows his greatness. His fearless approach and simplicity separates him from the other contemporary cricketers. As they say, every single individual has to fulfill a special purpose here - Sehwag’s purpose is to bat continuously whole day, every day, without getting tired. Calling him Steve Jobs of cricket wouldn't be wrong in my opinion. Like Steve, he is a visionary. He sees solution where others see problems. He didn't create the art of batting but he has revolutionized it. We should consider ourselves lucky to live in the same era where a cricketer like Virender Sehwag is playing. Delhi Daredevils Prayer Virender Sehwag Return In Team might be a morale-booster for DD. But then that's there is to it. If he doesn't perform, then DD will be just ignored, by everybody. Let us all hope that he sets the stadium on fire!